this standard serial killer mullet... AND the goldilocks mullet on this furry gent... I must say it's pretty rare that we can find a picture of such a glorious mullet and yet somehow the guy in the background ultimately steals the show. A feat indeed. HAPPY MULLET WEDNESDAY! I'll see what I can do - shows up perfectly on my end. 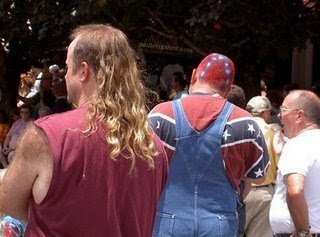 wow a double stars and bars, king mullet, and sasquatch back, the redneck trifecta. nice find, I am sure this tractor pull in sedalia was exciting. Devendorf does have a certain gravios mills look to hum but ended up in the big city with a pimp hand, go figure. Truely fantastic, thx for the eye-opening shots of the hockey hair, i.e. ape drape, i.e. Missouri Compromise (my favorite) side of life.